GANDERBAL, FEBRUARY 9: For the effective and speedy implementation of the Pradhan Mantri Kisan Samman Nidhi (PM-KSN) scheme, the District Development Commissioner Ganderbal, Dr. Piyush Singla today chaired a meeting to review preparation and finalize the modalities for its implementation in the district. 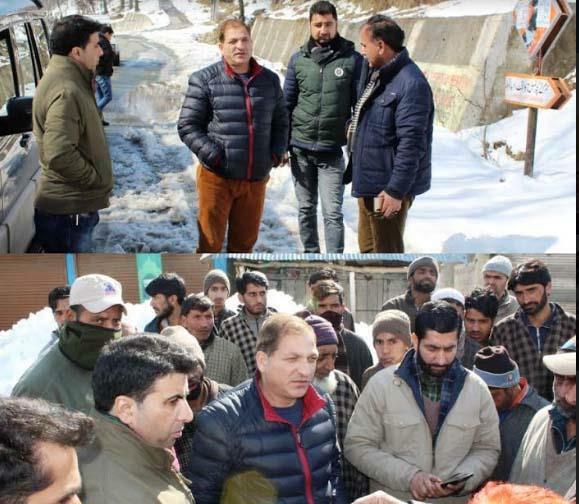 The meeting was attended by ADDC, Ganderbal Shafqat Iqbal, ACR, Ganderbal, Nisar Ahmad Malik, SDM, Kangan, District Agriculture Officer, District Horticulture Officer, Tehsildars, Patwaris and other concerned officials. A detailed discussion was held on various aspects of the scheme regarding uploading of beneficiaries’ data, preparation of a list of exclusive categories, activation of beneficiaries’ accounts, collection of data and organization of camps etc. Addressing the meeting, the DDC said that under the PM-KSN scheme, landholding farmer families, having cultivable land up to 2 hectares, will be provided direct income support at the rate of Rs. 6,000 per year. This income support will be transferred directly into their bank accounts in three equal installments of Rs 2,000 each, he added. The programme will be effective from 1st December 2018 and the first installment for the period up to 31st March 2019 will be paid in March, 2019. During the meeting, the DDC asked the concerned officials to finalize and certify the beneficiary list by 22th February, 2019 for uploading to the portal, so that the entitled benefits are speedily transferred to the farmers. The DDC asked the concerned officials to prepare database of eligible beneficiary landholder farmer families in the villages by capturing the details as per defined format like name, age, gender, category (SC/ST) , aadhaar number, bank account number and mobile number so that the information related to transfer of benefit can be communicated to the beneficiary. For the collection of data of beneficiaries and to generate awareness among farmers regarding PM-KSN scheme, field implementation committee was formed at Tehsil level which includes officials from agriculture/horticulture department, Patwaris and Tehsildar as nodal officer. DDC directed the officers of concerned departments to activate men and machinery and to expedite the process for effective implementation of this schemes at grass root level in the district so that the farmers can avail benefits of this scheme.